Condensation – Because the bottom of your basement walls is the deepest under ground, the bottom will also be the coolest. On a 90 degree day, the base of your basement walls may be only 60 degrees. That’s a 30 degree difference in temperature! When warm, humid air contacts the base of your walls, it will condensate or shrink. The smaller volume of air still holds the same amount of moisture, actually more moisture than it can hold. The result is little beads of moisture forming on the cool base of the walls and the floor. Because masonry is porous, it will absorb this moisture and appear damp looking. With enough humidity, the walls can actually get wet and drip, forming slight puddles. Remedy for Condensation – Get a good dehumidifier to remove the excessive humidity from your basement. Despite all the advice you may have heard, to let fresh air in, don’t do it! Along with the fresh air, comes humidity problems. Keep the doors and windows to your basement closed year round. With your doors and windows closed, your dehumidifier will run less and use less electricity. 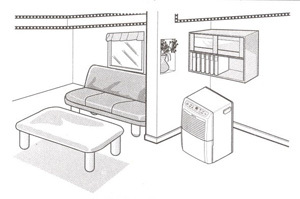 Even basements that don’t leak, can benefit from the use of a dehumidifier. Water Wicking Up From Below The Floor - Because of accepted construction practices, your basement walls usually continue down, lower than floor level. This is because they rest on the footer and the floor is poured last. 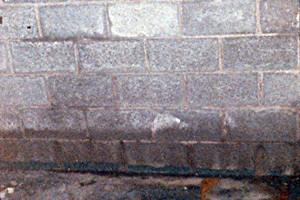 If water is present below floor level, the porous masonry can absorb this water and wick it up higher than floor level. Many times when a homeowner sees uniform dampness along an entire wall, it’s a tell-tale sign that water is accumulating underneath the floor surface. An approximately one foot wide trench would have to be cut along the walls affected. A ditch would be dug alongside to footer to allow for installation of drainage tiles. If any standing water was in the hollow cores of the walls, drain holes could be drilled into them, below floor level, to drain out any standing water. The walls should then be sealed with a permanent product that is capable of expanding and contracting as the foundation does. The walls should be sealed, all the way down below the floor, to footer level. The floor could then be concreted back to its previous state. By draining the water away, you are taking away the source of the problem. Like any other home improvement project, look carefully at any guarantees offered, to fully understand what is being covered and most importantly, what’s not.